Editorial note: This story was originally reported by Joanna Zuckerman Bernstein and Ben Klayman of Reuters. Business Insider has added additional contextual detail about the Takata recall. The dusty, industrial town of Ciudad Frontera, Mexico, has moved from the far reaches of the global auto supply chain to the front lines of an investigation into why air bags from Takata Corp are blowing up with lethal force in accidents. The Takata plant there has been confirmed as the source of defective air bags made in 2001 and 2002 and again around 2012, according to recall records, automakers and regulators. In 2006, the factory blew up, driving home for workers and residents the volatility and risk of the explosive compound at the core of Takata’s air bags. Airbag manufacturers such as Takata favour low-humdity regions to assemble airbags, due the the risks associated with inflator propellant. Prior to this week, the massive Takata recall in the U.S. had been regionally focused on southern states and territories such as Puerto Rico. But on Monday, the National Highway Traffic Safety Administration (NHTSA) expanded its recall demand of major automakers to be nationwide. A whopping 17 million vehicles with Takata airbags have been recalled globally. In the U.S., 11 million vehicles are now under recall. Additionally, NHTSA has ordered Tokyo-based Takata Corp to submit a wide array of records, including those pertaining to manufacturing controls at the Mexican plant, as part of an investigation into why its air bags have shot shrapnel at drivers in five fatal accidents from Oklahoma to Malaysia. On Thursday, executive from Takata and Honda are scheduled to testify before Congress. Apart from automakers and Takata, which controls over 20 per cent of the global airbag market, questions are now being raised about the governments lack of urgency regarding a recall whose details are disturbing. The Takata recall follows on the heels of two other massive recalls in recent years: the 2010 Toytoa recall for issues related to vehicles allegedly accelerating out of control; and the more recent General Motors recall, for a widespread problem with ignition switches that can disable airbags in certain cars. All five of the Takata victims – including three in the last 14 months – were hit by shrapnel from air bags in Honda vehicles. At least another 160 injury claims involving cars from several automakers have been reported to NHTSA, according to Reuters. Interviews with 21 former and current Takata workers and consultants, along with company presentations and email reviewed by Reuters reveal the pressure inside the Japanese supplier to ramp up output and drive down costs for inflators – the mechanism that triggers air bags to deploy in a fraction of a second after a crash. The accounts include the concerns of managers that workers broke quality rules to boost output. It isn’t clear whether the productivity pressures and quality issues they describe led to specific accidents. But the portrait they draw suggests that top executives at the company were not fully aware of what was going on at the foreign factories that churned out millions of air bags. So far, the Takata problems have led to the recall of over 16 million vehicles worldwide. “We are highly focused on cooperating with NHTSA and the (U.S.) government investigation,” Takata’s U.S. spokesman Alby Berman said in response to questions sent by email. The NHTSA administrative order requires Takata to supply documents and answer questions under oath related to any problems in producing air bag inflators. The order was prompted in part by an Oct. 17 Reuters report detailing production and quality problems at the Mexico plant. The company has until Dec. 1 to comply. In addition to the regulatory probe, Takata faces a criminal investigation by U.S. prosecutors.The investigations come as the Mexico plant gears up to make parts needed to replace millions of air bags in the ongoing vehicle recalls. 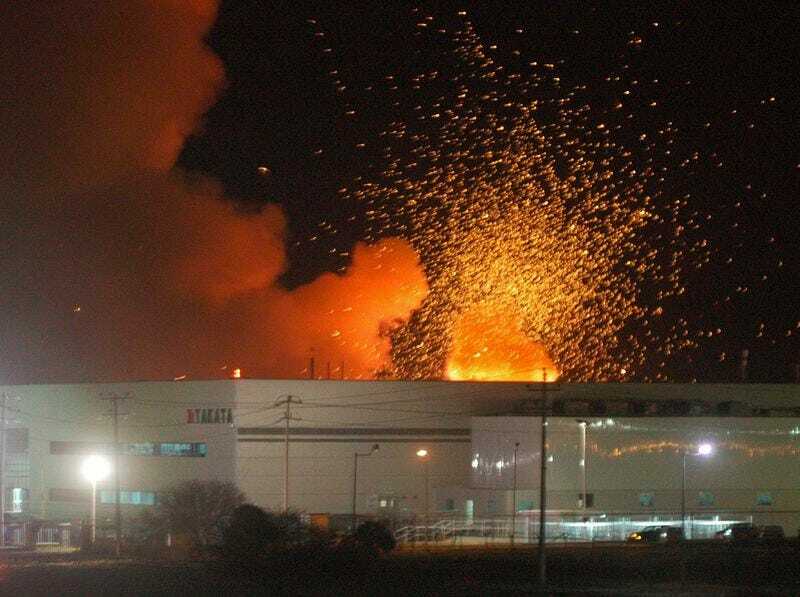 On the evening of March 30, 2006 Takata’s Mexican air bag factory exploded a year into its run as the company’s main inflator production point. The series of blasts blew out windows on houses a kilometer away and threw up fireballs as workers and residents fled to escape injury, witnesses say. Remarkably, residents and workers say, there were no injuries. Hundreds of workers inside the factory that evening all managed to evacuate, some by climbing over a factory fence because a gate had been mistakenly left shut. Takata never announced the exact cause of the 2006 explosion, workers there at the time said. An official at the fire department, where Takata has donated trucks, said he had no records from that time. Some workers said the blast was fuelled by bunkers of ammonium nitrate stored next to the plant. Takata air bags are inflated using ammonium nitrate, an explosive propellant that is encased in a canister to make an inflator. Josefina Vargas lives next door to the Takata factory. She said the first sign of trouble from the factory was a thin line of smoke visible from the sidewalk in front of her house. Vargas, 52, who did not work at Takata, remembers her shock as explosions threw fiery debris almost to her feet as she sat outside her house. Vargas and others fled by foot and by car. Takata’s Berman said the company’s safety training had “allowed for the successful evacuation of thousands of employees within a few minutes of the discovery of the fire and prevented a possible loss of life.” He said the company had put new safety policies in place after the accident. Alejandro Perez, a former Takata facility manager, stayed at work for four days straight after the accident, taking short breaks to go home and nap or shower, he said. The company offered workers who returned and stayed on the job special incentives, Perez and other workers say. Takata raffled off televisions, refrigerators and cars, and even held Easter services at the plant for workers on the job that April 16. Takata managers were proud of the comeback. They marked the rebuilding with a commemorative in-house coffee table book with pictures of the blast, and baseball caps stitched with the exact date and time of the first explosion. The company took a $US21 million charge as it prepared for an IPO in November of that year. Within a month, Takata had resumed production, fast enough so that customers such as Honda Motor Co., Ford Motor Co. didn’t have to shut down their own factories due to lack of parts. Rival Autoliv also stepped up its output to make up for what Takata could not supply, the companies said at the time. Demand for airbags in the current auto market is high, as automakers surge toward sales figures not seen since the pre-recession peak for the industry. In 2014, the U.S. auto market in on pace to see 17 million new cars and trucks sold. Takata has protested NHTSA’s demand for a nationwide recall, on the grounds that fixing potentially defect airbags outside the initial recall region will limit supplies of replacement components that could be used in places where the airbags are more likely to malfunction. On the ground, the pressure to restart and make up for lost production was unrelenting, especially from American managers who had been flown to Mexico, said Perez, the former facility manager. He was laid off at the plant in 2008. Other workers also said pressure remained high. Takata workers said they had to make a quota of inflators – sometimes more than 200 per hour. “If you didn’t make it, you would be behind and they wouldn’t pay you a productivity bonus,” said Jose Sanchez, 42, a former worker who made inflators at Takata from 2004 to 2010. In 2010 and 2011, the Monclova plant was consistently behind quota in making a new kind of driver’s-side air bag inflator. In an effort to crack down, supervisors used security cameras to catch workers on a line “fooling around,” and apparently engaged in conversation rather than making inflators, an email circulated to staff that included still images from a camera shows. Takata’s Berman said security cameras at the plant were there to prevent theft and not intended to monitor workers. Around the same time, a worker was also cutting corners by trying to “rework” or fix defective parts on the inflator assembly line. That would have made it easier for them to meet output quotas. But Takata prohibited that practice in order to reduce the chances of bad parts being shipped to automakers, according to an email. Inflators identified as defective were supposed to be placed in a separate, red bin and then examined and repaired if possible by other workers, according to former workers. Apud declined to comment. Berman said Apud was acting to reinforce company safety guidelines after finding an employee had improperly reworked an inflator. “The email is an example of the manager performing his supervisory responsibility and enforcing company quality controls,” he said. In 2012, Takata workers at the Mexico plant put the wrong part into inflators being readied for shipment, according to documents Takata and automakers filed with NHTSA. More than 350,000 vehicles from three different car makers were later recalled for that defect. The mistake was possible because parts bins were kept too close together, the company told regulators in Japan. The mistake was not discovered until after a lawsuit was filed over an October 2013 accident when Brandi Owens, then 25, hit another car in stop-and-go traffic while driving a new GM Chevrolet Cruze. The Cruze’s air bag exploded and hit Owens so hard it blinded her in the left eye, she said in the lawsuit filed in April 2014. Her case prompted a recall two months later, in June. Owens settled with Takata and General Motors Co on undisclosed terms in August. A fatal accident just after that June vehicle recall illustrates the complexity of the problem facing automakers and safety investigators. Takata said a defective inflator from its now-shuttered plant in the U.S. state of Georgia was installed in a 2003 Honda City assembled in Thailand and sold in Malaysia. On July 27, Law Suk Leh was driving that car when she hit another vehicle in the Malaysian town of Sibu on Borneo island. Law, who was in the final stages of pregnancy, was killed by a “severe puncture wound” to the neck when she was hit by a metal fragment after the car’s air bag blew apart, Malaysian police said. Honda revealed details of the death last week in announcing a recall of another 170,000 vehicles to replace their air bags. For Takata, building the factory in Mexico in 2000 would enable it to help meet booming demand for air bags with cheaper labour, projections prepared for executives show. By moving inflator production from two plants in the United States to Mexico, Takata saved $US70 million in labour costs over five years to 2006, an internal company presentation shows, dropping the labour cost for making an inflator from $US2 to about 75 cents. Takata’s automaker customers benefited: the cost to them fell by more than 20 per cent to less than $US20 each, according to the presentation. Mexico’s auto industry has benefitted greatly from the North American Free Trade Agreement (NAFTA), which has enabled the country to position itself as source of low-cost labour in close proximity to the world’s most dynamic market for automobiles: the United States. By spring 2005, Takata’s big bet on the Mexican factory appeared to be paying off. Workers at the Monclova plant, as it was known in the company, posed for a commemorative photo, raising both hands in the air in a banzai salute. Soon afterward, Takata closed its factory in La Grange, Georgia, southwest of Atlanta. Takata had been reducing inflator production there and at a second U.S. plant in remote Moses Lake, Washington for four years, records show. Worker morale had suffered at the plant in Moses Lake, built on the site of a former U.S. military base, workers there told Reuters. By 2000, a new management team prioritised meeting output quotas and enforced overtime as demand for U.S. cars and SUVs soared, former workers say. “We just burned people out,” said one former worker, who like others asked not to be named. In 2002, the plant laid off 100 workers and sent more production to Mexico, media reports at the time said. A series of mistakes by workers in handling ammonium nitrate at the La Grange, Georgia and Mexico plants between 2000 and 2002 left the explosive compound exposed to dangerous levels of humidity, Takata told regulators in the United States and Japan. Takata says inflators could be susceptible to rupture if exposed to moisture or extreme humidity. The defect in Law’s airbag in the Malaysian accident was caused by humid conditions at the Georgia plant, Takata and Honda said. It is unclear how much Takata’s headquarters in Tokyo knew about the problems at its inflator plants. Takata did not dispatch permanent staff from headquarters to the Mexican plant as it ramped up output, workers say. A Takata safety auditor dispatched from the United States inspected the Mexican inflator plant in May 2011 and found problems in handling the volatile ammonium nitrate. His audit report, seen by Reuters, faulted the plant for not closing bags of the compound tightly enough and for storing scrapped or contaminated propellant near good material, risking mix-ups. He said in his report he would not send the audit to Takata’s headquarters in Tokyo. Shigehisa Takada, the grandson of the founder, now chairman and chief executive, has said the company made a mistake by allowing too much autonomy to its local managers in North America during a period of rapid growth. Takata acquired at least six companies in the United States and Germany between 1989 and 2012. “Back then, the U.S. markets were expanding very rapidly, and we could not see everything that was happening there,” according to a recording of Takada’s speech to a closed shareholders meeting in June. It was his most recent public appearance.